This link shows a mortar that I just completed. Something that I hadn't mentioned in my description of this steam launch before, and in regards to the floorboards visible throughout the bottom of the interior of the boat, is the fact that there actually is a one-piece sheet stainless steel floor beneath the wooden planks, that the planks are fastened to. This gives the launch the authentic look required for the period, yet allows for the structural integrity required, keeping everything securely fixed in place. When I originally began the project, and was working on the design, I realized that at one time or another there was the possibility that I would need to be able service the components that make up this steam launch, and not being proportionally sized to the boat, it would be challenging to get at the various components, especially those located lower down. 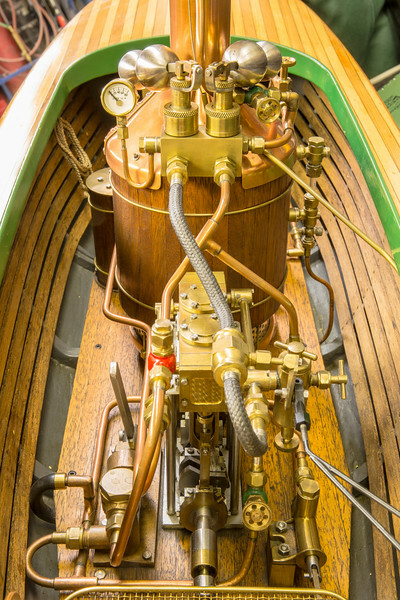 Normally this is not required, as most of the servicing required before or after running the steam launch, consists of oiling the various bearing-cups located on the engine and at the other locations within the launch. The 1 pound disposable propane-tank located in the bow, can be replaced without removing the running gear.